A Correct Chart of the. 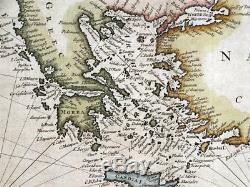 From the Straits of Gibraltar to the Levant. For Paul Rapin de Thoyras. From Nicholas Tindal's Continuation of Paul Rapin's "A History of England". Published by John & Paul Knapton, London 1745. 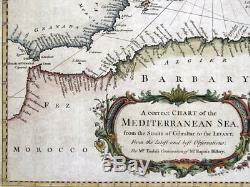 A good sized original 18th century copper engraved antique chart of The Mediterranean Sea enhanced with attractive later hand colouring. A beautiful eye catching map covering the Mediterranean and all the adjacent countries including Spain, North Africa, Middle East, Cyprus, Malta, Turkey, Greece. 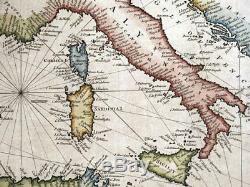 Italy, Corsica, Sardinia, Sicily, Croatia, France, Balearic Islands etc. 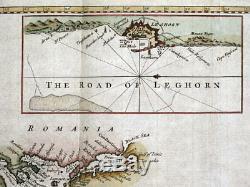 An inset detail map covers Leghorn (Livorno, Italy). A crisp dark impression on robust hand laid paper, with foldlines as issued, blank verso. Fine condition other than some light browning to the outer margins and a small paint smudge. (off Syria - see close up). 28" x 13.5" (710mm x 340mm) map area only, with good margins beyond. 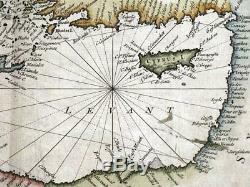 A GENUINE ANTIQUE MAP GUARANTEED OVER 270 YEARS OLD FROM LINDISFARNE PRINTS. 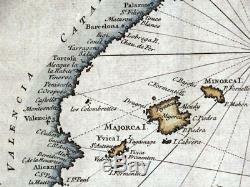 The item "MEDITERRANEAN SEA CHART, Italy, Spain, Greece, Africa, R. Seale antique map 1745" is in sale since Thursday, January 17, 2019. This item is in the category "Antiques\Maps, Atlases & Globes\Europe Maps". The seller is "lindisfarne2" and is located in Shrewsbury. This item can be shipped worldwide.